I generally do not count my Travel a Trip unless it has number of stops for Chai & Sutta and this one was devoid of it. Hence, it was really more of a Pilgrimage than a trip. Week of Diwali, when hustle was in city out of blue; few of my cousins planned a car trip to Kedarnath, Adobe of Mahadev; and me being the sort of nomad in home, was automatically picked without an option. Well we all know not all of your cousins are best friends; and there is always one who is doing lot better in life to screw your happiness and to make things worst, one of my Uncle, a true devotee who don’t even eat non-veg decided to join. So all in all it was a Pilgrimage which started early morning of 8th November, the plan was to visit the shrine on the closing date of 9th November. With an elder person accompanying you, rest assure you will start on time and will be carrying all basic necessities such as breakfast, lunch and snacks for midway with you. So we started at 0500 in the morning with an aim to cover the distance by afternoon 1400-1500 hrs, as mentioned by Google. Overall it was an uneventful drive till , with we 3 cousins switching seats. I being a non-driver was sitting next to driver for most of the parts and aunt relaxing in the back seat. By 0900 Hrs we reached holy town of Devprayag (114 km); famous for being the confluence point for River Ganga (Bhagirathi) and its major tributary River Alaknanda. After savoring the natural beauty, started off again; and after a drive of 40 kilometers reached the beautiful town of Srinagar; located on the banks of River Alaknanda. The valley is widest at Srinagar, which is an important town in the Garhwal division of Uttarakhand. 35Kms ahead we reached the town of Rudraprayag, which is famous for being the confluence point of River Alaknanda and its tributary River Mandakini. It is at Rudraprayag from where the highway branches off towards Kedarnath from NH-58; and after a drive of another one hour and fifteen minutes we reached GuptKashi by 1430 Hrs where halted in the market for Lunch. Since we had ample time to reach Gaurikund where we had planned night stay, we decided to visit The Vishwanath Temple. The Vishwanath Temple in Guptakashi has a stark visual similarity with the Kashi Vishwanath Temple of the holy city of Varanasi. This may be the reason for the similarity between the names of the two temples. 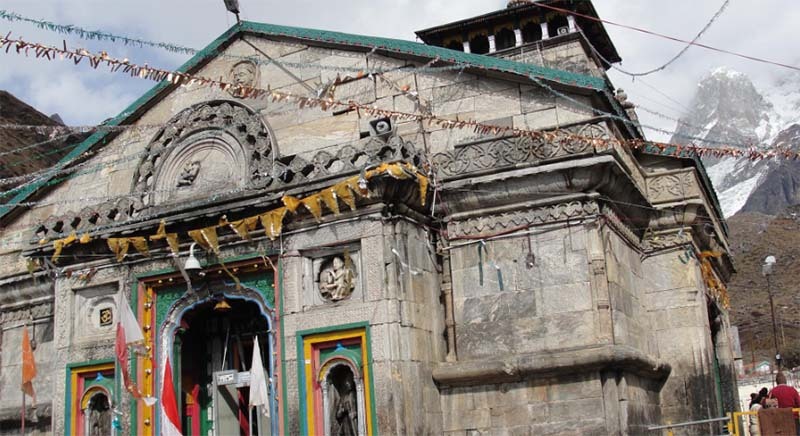 Aside this, the Vishwanath Temple is also part of the Rudra temple conglomerate of Rudraprayag that conjures up the temple chain of Panch Kedars and the Chota Kedarnath. In Vishwanath Temple complex, there is a small pond called the Manikarnika Kund, in front of the temple gate. 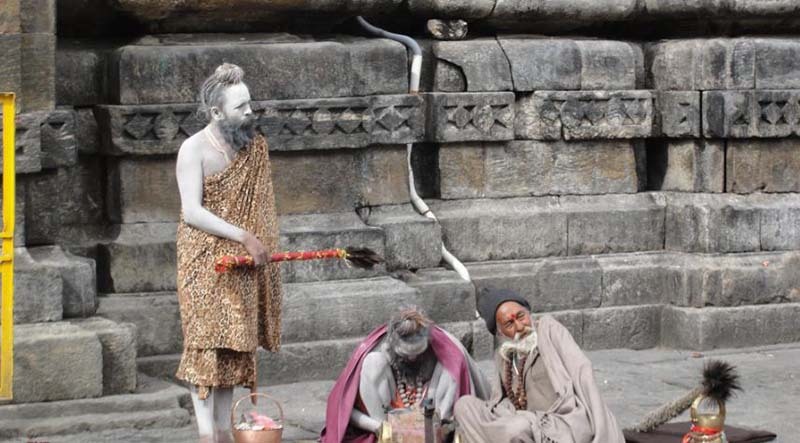 A Shiva-linga is bathed here by two springs, representing the rivers Ganges and Yamuna. The Yamuna spring water go out from a goumukh (nose in the shape of a cow’s mouth); and the Ganga spring flows through trunk of an elephant strategically placed above the linga. By 1630 Hrs we headed for Gaurikund, which is the base camp for trek to Kedarnath. The very first striking view of the morning from Guptkashi was of the Chaukhamba massif. The road between Guptkashi and Gaurikund was damaged at many places due to landslides and work in Progress, which slowed the progress. It took 2 Hrs to cover a distance of 38 kms. Reached Gaurikund by 1830 Hrs. We stayed at Shivalik Valley Resorts; a good hotel with Warm stay and decent enough food. After early Morning Tea at 0700 Hrs and light breakfast; we left the Hotel towards Kedarnath Foot Track inception; nearly 3 kilometers from the Hotel. After parking the car, we started for our trek towards Kedarnath by 0830 Hrs which was 13 kilometers away. 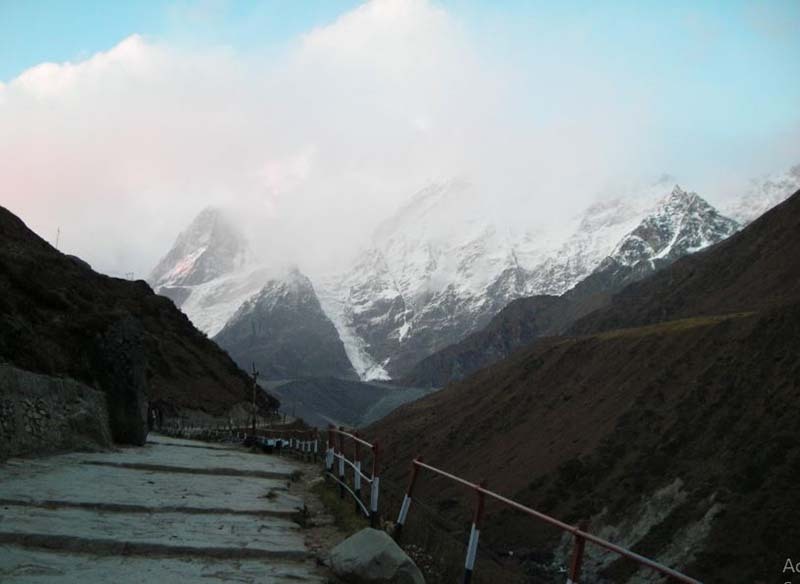 The trek from Gaurikund to Kedarnath is a tough one as the ascent is too steep right from the starting itself. The altitude rises from 1,982 meters at Gaurikund to 3,583 meters at Kedarnath, a rise of 1601 meters (5252 feet) within a span of 14 kilometers, making the trek a challenging one. We stopped for lunch en route at Rambara, which was a major halt on the Gaurikund – Kedarnath trek before the massive flash floods of 2013. The trek is much steeper from Rambara onwards. After a tiring and arduous trekking of 14 kilometers, we reached Kedarnath Town by 1530 Hrs. It took us a total of 7 Hrs to trek from Gaurikund to Kedarnath, the actual trekking time was 5 Hrs 30 Mins; plus 1 Hrs 30 Mins of halts for relaxation, food etc. The temperature was pretty low and we could feel the chill in the air. We checked into a lodge near the temple and decided to rest before we go to shrine. 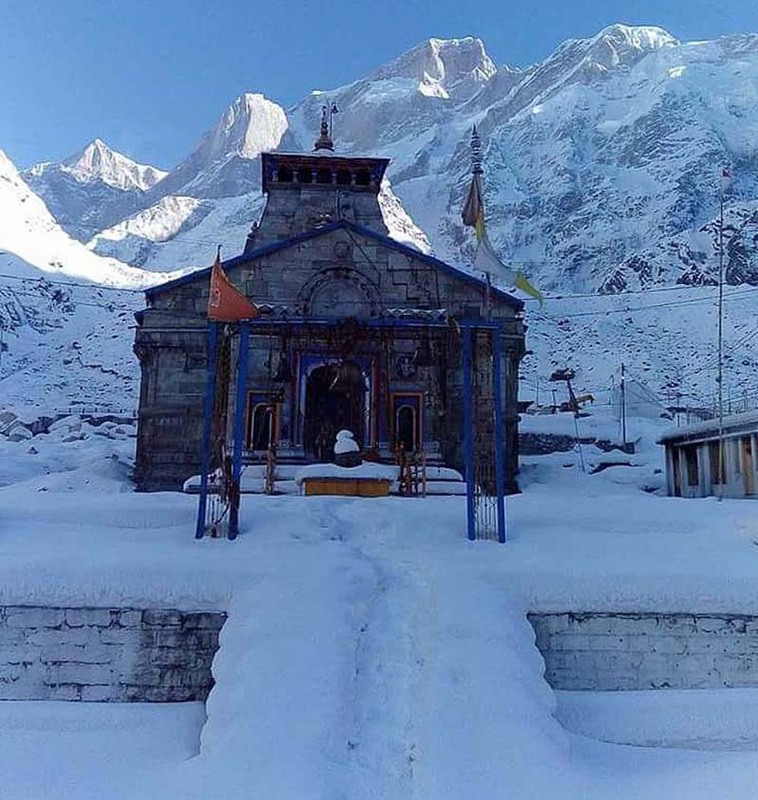 Kedarnath is a scenic town set in a bowl shaped valley surrounded by towering Himalayan peaks. The most prominent among them are the Kedarnath Main; and Kedarnath Dome with an elevation of 6,940 meters above sea level. 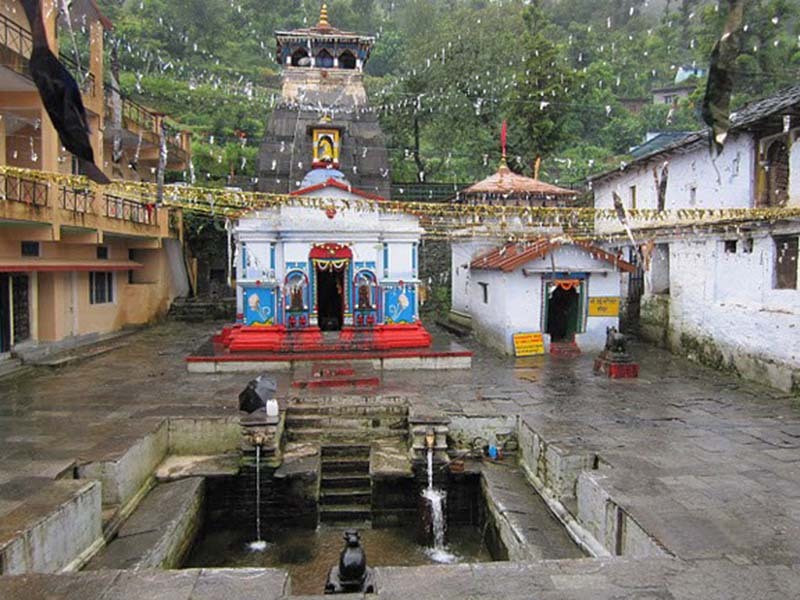 The Kedarnath temple lies in the center of the town; and is believed to have been constructed in 8th century AD. The whole structure of the temple has been marvelously carved out from huge boulders. Such was the architectural acumen of those times that the temple stands to this day; despite bearing the countless vagaries of nature in the form of floods and earthquakes. The temple has been beautifully constructed on a raised platform made of huge stones cut into rectangular shape, to give it a firm and strong base. It is amazing to note that how difficult it would have been for the workers and architects to construct the temple at such a remote, dangerous and high altitude terrain during the historic times, bereft of any modern day technology. 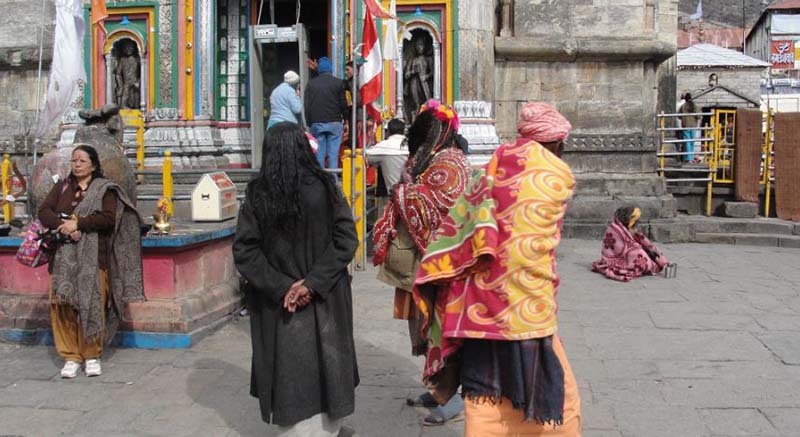 It being the fag end of the yatra season, there were not many visitors in the town, which otherwise bursts to the seams during the peak season in the months of May and June. 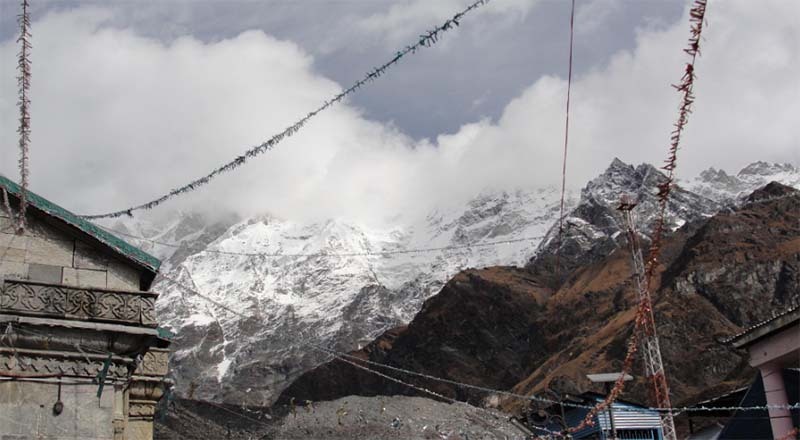 The towering snow capped mountains provide a striking background to the temple. We checked into a lodge near the temple; and decided to stay indoors as the temperature outside had reached around freezing point after sunset. After relaxing for an hour we had our dinner by 2000 Hrs; and went to sleep by 2130 Hrs for a much deserved rest after an exhausting day. That was the end of day two of the trip. With temperature already dipping in night and feeling the chill in lodge, we were expecting Snow Clad Temple in the morning. And boy, were we not amazed with the astonishing beauty of nature. And with this view as a memory to remember forever with us, we started our descent. Descent was quite steep and we reached Gaurikund by 1400 Hrs. After having our lunch at Gaurikund, we decided to stretch to Dehradun; and planned to reach there by Midnight. We were at Srinagar by 1900 Hrs; when I received a call from an old school friend who had planned a get-together at Byasi, Rishikesh. After a bit of hesitation and argument with my cousins; they agreed to drop me on way and head back to Dehradun. That was a end of Pilgrimage and start of a Trip. And, that’s how Life is when one road ends Another Begins… A End Of Pilgrimage, A Beginning of Another Trip!! 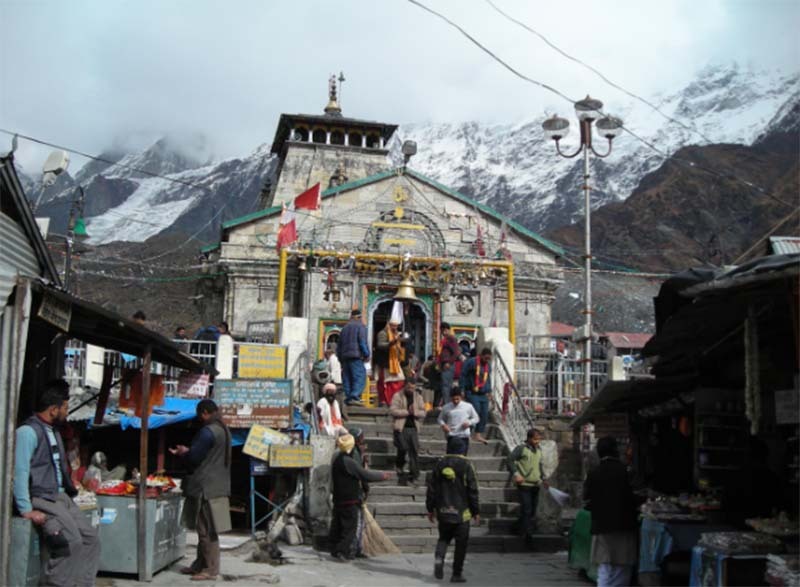 I hope the details above could be of help in planning your journey to Kedarnath,. If you have any questions; please do ask in comments section below; or at our Community Forum; and I will gladly answer. Sagar is based out of Dehradoon and loves to travel around as much as he can. 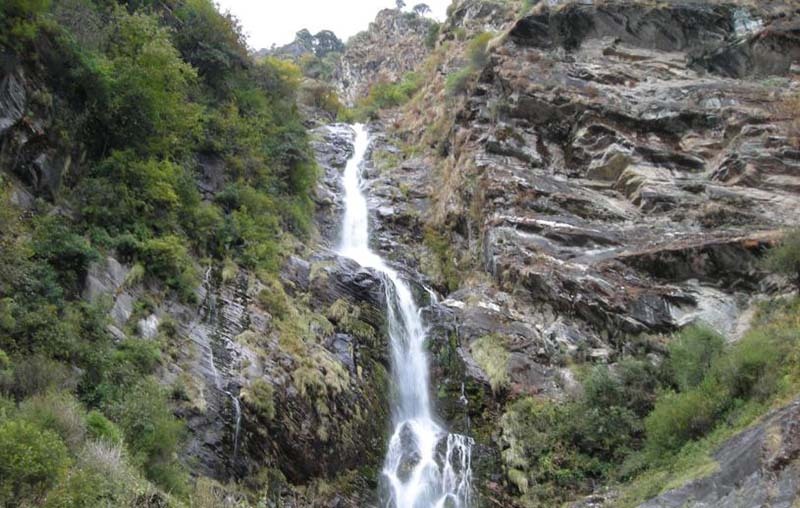 He has been to numerous places in the hills of Himachal and Uttarakhand and continues to add more places to his list.